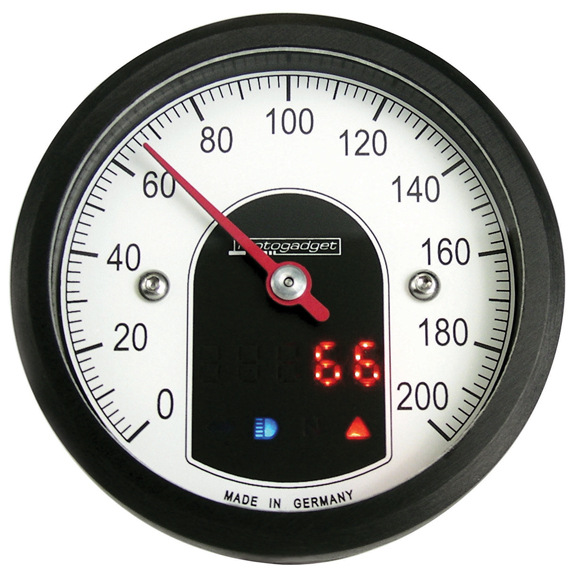 Our Mini Motorcycle Speedo’s feature 1.90 inches (48mm) diameter for a minimalistic look. Speed can be set in either miles per hour or km/h. If speed goes over 200, it will be displayed on the LED display. 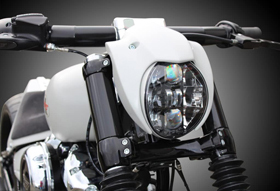 The LED dispay in the middle of the motorcycle speedo offers the following functions: total distance (odometer), maximum speed, on-board voltage, time. There are also four colored LED’s for oil pressure (red), neutral (green), high beam (blue) and turn signals (yellow). Our Mini Motorcycle Speedo’s can fit in our De Luxe Motorcycle Speedo Housing, Ring Motorcycle Speedo Housing and in our Alcatraz Motorcycle Speedo Housing. Speedo housings are sold separately. No other parts are needed, the kit already comes with magnets to build your signal on the front wheel. Very nice speedo! Any additional parts required for a HD 2010 XL883N ? Will it wire into the existing sensors? Thank you for your interest in Eurocomponents’ mini motorcycle speedos. 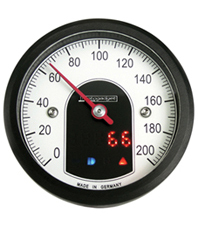 Our Mini Motorcycle Speedo can fit your 2010 Harley XL883N, no additional parts required. 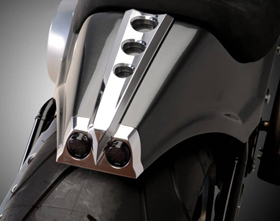 Do I need to use the magnets for the signal or can it be wired into the existing speedo wiring that provides the signal for the Harley speedo ? I will email you mini speedometer mounting instructions. I would love this even more if there were a built in tachometer…. seems Harley did not want to waste time making a tach/speedo combo that looks nice on anything pre -05. Anyway… 2 questions about this unit. 1. I am looking at replacing the stock on a 02 XL, anything additional needed for installation? 2. I am assuming that ” total distance (odometer)” means mileage on motorcycle, is this correct? can it be set to match my current mileage? 3. does this unit have a trip meter? 2. I am assuming that ” total distance (odometer)” means mileage on motorcycle, is this correct? Can it be set to match my current mileage?